On the eve of a new Muppets movie, a writer honors Miss Piggy’s place in the gay pantheon. “No, he wanted to be Miss Piggy,” my mom insisted. I shrugged noncommittally and cleared my plate. The truth is that it was a little of both. As a child, I was enthralled by Jim Henson’s menagerie; my Muppet lunchbox followed me from apartment to apartment and remains on my windowsill today. If the Muppets celebrated individuality and a community that can be forged among outsized personalities, then Miss Piggy shone the brightest. I can’t remember a time in my childhood that didn’t involve her. Of course, I idolized her—for her glamour, her bravado, her karate skills, her poor French. I envied her confidence, but I also wanted to curate her wardrobe. She was my first exposure to flair. She was also the prototype for every female friend I’ve had. First there was Ivy, my nursery school “girlfriend,” who joined me on sugar highs; then Laura, the outspoken star of our high-school plays; Allysha, the voluptuous bottle blonde I met at an improv audition at Yale; and now, Rachel, the zany Nebraskan playwright with the ad-exec husband. None are “hags;” like Miss Piggy, they’re high-maintenance beauties with determination. 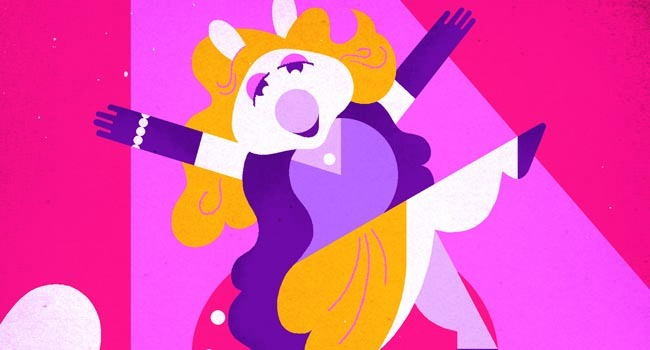 Diva worship is a hallmark of gay culture, and Piggy deserves a place in the pantheon. According to the Muppet designer Bonnie Erickson, she originated as “Miss Piggy Lee”—an homage to Peggy Lee. As her popularity grew, she blossomed into a hyper-glam parody of a Hollywood star, which is what she inevitably became. She worked with the greats—think of her rivalry with Raquel Welch on The Muppet Show, or her demented makeup party with Joan Rivers in The Muppets Take Manhattan (“A powder puff for you, and a powder puff for me!”). My favorite Miss Piggy moment comes from The Great Muppet Caper, when, on her way to stop a jewel heist, she gets stranded on the side of the road. A truck whizzes by, and, as if by magic, out pops an unoccupied motorcycle. Piggy turns the camera and squeals, “What an unbelievable coincidence!” This is after she poses as a fashion designer and breaks into John Cleese’s house and gets framed by Charles Grodin and escapes from jail. Despite her excesses, Piggy maintained an abiding loyalty to Kermit. Their interspecies romance is conspicuously unconventional—perhaps a little deviant—but it’s always true. Like Lucy Ricardo, her pursuit of fame is trumped only by her devotion to her frog—and damned if she won’t end up with both. I’m not saying that Kermit is gay (my money’s on Fozzie), but they do seem to have the same dynamic as Georges and Albin from La Cage aux Folles.